Late last year I was issued a challenge by the Australian PR team handling Annie Sloan Chalk Paint®—find a piece of old furniture and use Annie’s paints and waxes to turn it into a masterpiece. Okay, perhaps they didn’t say masterpiece exactly, but that’s totally what I was thinking after watching hundreds of different DIY shows over the years. The beauty of Chalk Paint® is that it has been made specifically for painting furniture, painting floors, and for giving walls a completely matt, velvety finish. It also sticks to just about any surface. It seemed so simple that within moments I was daydreaming of quitting my job to spend my days in an over-sized man’s shirt with paint splattered across my face as I transformed old discarded pieces of junk into in-demand refurbished pieces of furniture. Obviously, I jumped at the chance to take part and was soon pouring over the catalogue of colours trying to choose which two paints and waxes to test run. But before I unveil my masterpiece (and I warn you, it’s pretty impressive), I’d like to introduce you to the woman who has been hailed as the UK’s answer to Martha Stewart … but without the prison stripes! A painter at heart … Annie Sloan. Annie Sloan is a trained painted, an author and a former rock star. She studied Fine Art at Reading University before branching out into painting murals for commission and then running paint courses where she taught students about paint finishes, gilding, découpage and furniture restoration. 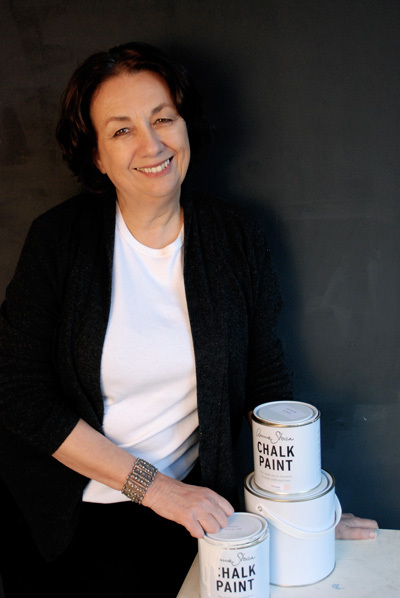 But it’s the easy-to-use chalk ‘paint for girls’ which she developed in the early 1990’s that has made her a household-name among the DIY-set. But is it really just for girls? “The full quote is “It’s girls’ paint, but boys can use it too”,” Annie said, adding that she stopped using the line when people thought she meant something sexist. “What I meant is that previously paint had always been sold in what I call ‘boy’s’ shops—places where you find ladders and buckets etc, and going into those shops in my early years of painting always left me feeling intimidated. “I had been to art school for 7 years but they always treated me as if I knew nothing; they felt there was a right way to paint and a wrong way to paint and in these shops, there was little acknowledgement of colour and decoration. That’s right … there’s no need to sand or prime your furniture before painting. Born in Sydney, Annie’s family moved to England when she was 10 years old, but despite her English ways she remains an Aussie at heart. Annie says the development of her paint range stemmed from her own frustration at the decorative paints available at the time. “I was interested in the concept of making paints; I wanted it to be absorbent, be able to give me texture, to give a wash and to be able to do smooth coats too,” she said. Despite amassing a loyal following, it wasn’t until the Global Financial Crisis hit in 2007/08 that Annie Sloan Chalk Paint® became an ‘overnight success’. “We had always done well in a recession but it wasn’t until this very deep worldwide recession that the brand really started to take off; vintage pieces and trawling second-hand shops for finds became fashionable and this has all been fueled by the internet,” Annie said. Social media has also contributed to the company’s success and a quick Google of ‘Annie Sloan Chalk Paint’ reveals almost two million mentions. “Vintage pieces and trawling second-hand shops have become fashionable again and Facebook, Twitter and bloggers have all contributed hugely to our success,” Annie said. Despite her success, Annie remains an artist first and foremost. “I am a real person who is very much doing it; painting and writing and involving myself and my ideas. It’s me first, not company first. It’s all quite holistic; it has depth, knowledge and history,” she said. “I have to keep painting; it’s my time to be and to think or un-think. “I have a Barcelona Orange table I love which is painted over Aubusson and Chateau and rubbed back; I did it years ago and still love it,” she said. “There is no one colour I love because colour is about combinations and about context. All the colours have a place,” she said. 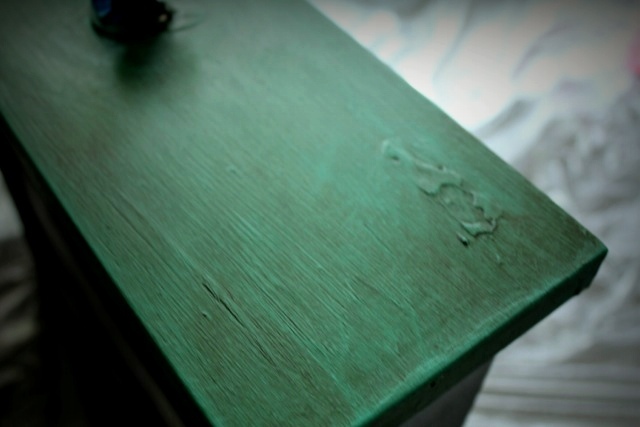 Here’s a sneak peek of my project for Annie Sloan Chalk Paint®. Click here for my tips and tricks for using Annie Sloan Chalk Paint® as well as before and after pictures of my project. 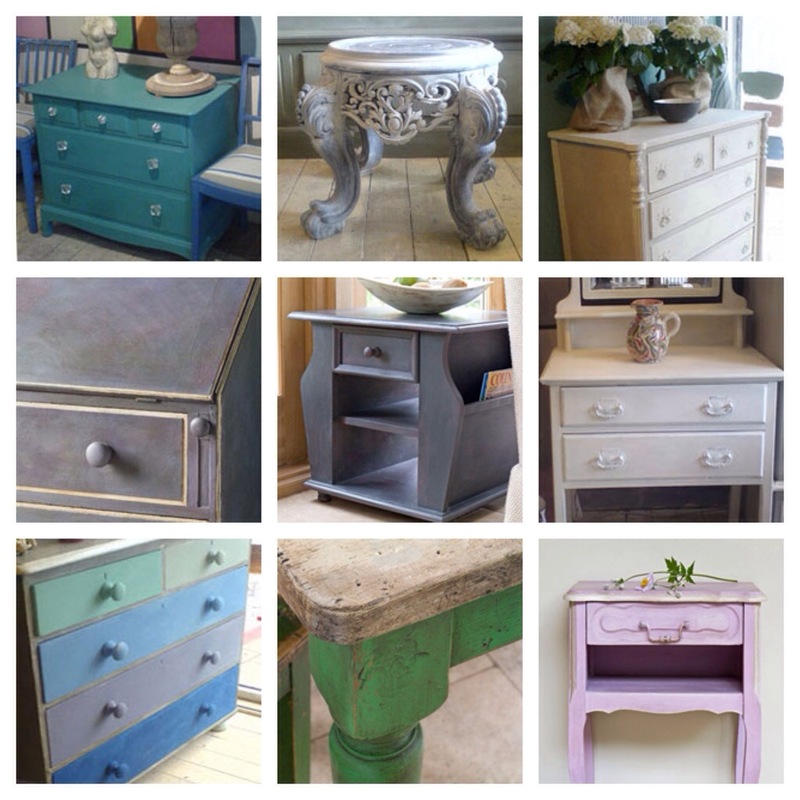 To find out where you can purchase Annie Sloan Chalk Paints, click here. Editor’s Note: This is a sponsored post brought to you by Annie Sloan Chalk Paint®. All opinions are 100 per cent the author’s own. Hi, I thought your followers might like to know where they can find this wonderful product. There is a link on the Annie Sloan website to Australian and New Zealand stockists, with further links to each stockists own website. So lovely to hear the the news about Chalk Paint™ being spread in Australia in such a positive and informative (and very Australian) way. Thanks Catherine! I did have the stockists in there but I must have lost them along the way but they’re back now… And thanks for adding this in. Tomorrow I’ll upload my tips and pics from my project. I’m already looking for my next piece of furniture and one of my friends from work is doing one this weekend too! Now I sound like a nag….but the link doesn’t work! I am looking forward to seeing your work tomorrow – it is an addictive process, you will start looking at all pieces of furniture in a new way! Not a nag… I’d rather know. Sorry I’m trying to do it by iPhone! Should be working now. And keep in mind my painting experience only extends as far as my nails!